She carries it in her mouth and fusses over its wellbeing. Upset when it is lost, she whines, begging to be let out to search for this new love. Green with spiny horns growing out of its elongated flat-fronted snout, it squeaks and carries on at the least bit of nudging. Arayo is protective of her new charge, certain it is a her own. I shudder to think what the father looked like, to produce, with my beautiful girl, this bizarre child. There is no accounting for those we cherish the most. I adore this dog. She is all I find good in the world. Sweet natured, accepting of what life lays at her paws. A wonderful companion, interested in exploring the world and meeting new people. The perfect ambassador, teaching humans astute enough to notice how to navigate the land-mines of human interactions. 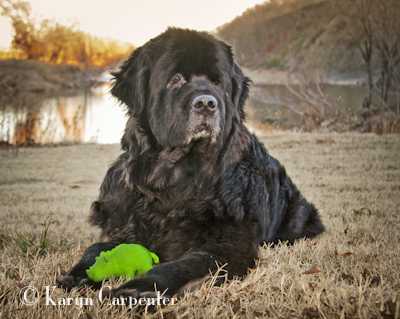 She is my dearest friend, just as this green squeaky toy is her child. Arayo thinks she's had a baby and this razorback pig is her pup. It has pushed me towards making a decision I've danced away from for 7 very short years. It is time to spay before her body is too old, before infections can take hold which would easily kill her. Arayo and I hit the road again today, traveling to central Missouri to the Veterinary Medical Teaching Hospital at Columbia. Our questions are many, the surgery not risk-free. We ask that you keep us in your thoughts and prayers - that she comes through this as she has most things in life - with ease - and that I don't totally go off the deep end as I worry through the process. Many of you have helped as I've fussed over making this decision. To each of you, I thank you for your patient input and knowledge. I couldn't do it without you! I'm checking in to let you know I've prayed, lit candles, and thought good thoughts. I haven't yet brushed up on my voodoo dance, though. Maybe tomorrow? Keep us posted! Go for the VooDoo dance, Angela! Rattle some chains. You know the drill!